ASIS 2015 — Anaheim, CA (September 28, 2015) – DW® (DW®), the industry leader in digital video recorders, surveillance cameras and related management software, announces a revolutionary addition to our AHD (Analog High Definition) camera line. The new STAR-LIGHT AHD PANO™ 6MP IR Cameras offer 3x1080p AHD image sensors to provide panoramic 180° views. The cameras are being demonstrated at the ASIS International Seminar and Exhibits, September 28 – October 1, 2015, in Anaheim, California, Booth 531. With user-friendly features such as UTC for full OSD control using existing coaxial cables, DW® AHD high resolution solutions have been engineered to utilize an existing analog system, increasing ROI by reducing installation time and complexity to provide an HD surveillance solution in minutes. Groundbreaking STAR-LIGHT AHD™ High Definition Cameras use existing coaxial cables to transmit crystal-clear detailed 1080p images at up to 30fps. The PANO models have three BNC connectors, one for each sensor. The video streams can be brought into the CMS in a 180° view by placing them side by side (three across). The cameras offer fixed 4.3mm lenses and powerful features such as Wide Dynamic Range (WDR), True Day/Night with Mechanical IR Cut Filter and Smart IR™. The STAR-LIGHT AHD cameras are engineered to work with VMAX AHD DVRs, offering an easy upgrade from analog to high definition surveillance using existing or new infrastructure for a cost-effective, high resolution surveillance solution. 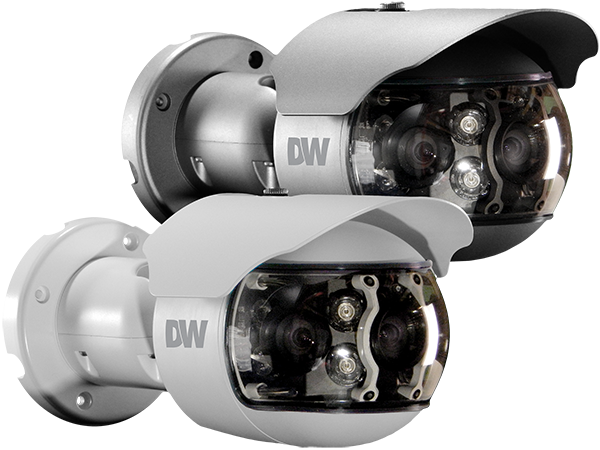 DW® empowers our customers as the industry-leading single source of value-driven complete solutions for all video surveillance applications (analog / hybrid / IP enterprise), focusing on ease of use and ROI. DW® products offer technologically-advanced features including Star-Light™ super low light technology, WDR, Smart DNR™ and Smart IR™. Complete IP megapixel surveillance solutions include MEGApix® cameras and edge recording systems, Blackjack™ NVRs and DW Spectrum™ IPVMS for server, mobile and on-camera control. Complete analog surveillance solutions include STAR-LIGHT AHD™ 1080p and STAR-LIGHT MPA™ 1.3MP 960H cameras, VMAX™ DVRs and mobile management applications.